At Stony Brook Lodging we understand that the perfect vacation is one that meets every single one of your needs. Because of that, we want to help you in your search for Gatlinburg 3 bedroom cabin rentals by giving you these tips for picking out the one that is right for you. We want to make sure you are completely satisfied with your vacation in Gatlinburg, and will do whatever it takes for you have the time of your life during your stay. Planning your budget ahead of time is the most important step to choosing a cabin. It is important because it shouldn’t be a problem for you to find a cabin within your budget, and you shouldn’t spend more than you have to. Our Gatlinburg 3 bedroom cabin rentals are very affordable, and we even have Gatlinburg cabin specials for an even better deal! The next step is determining how many of your family and friends are coming along with you, so that you pick the rental with enough space. You might think that all 3 bedroom cabins accommodate the same amount of people, but that isn’t the case. At Stony Brook Lodging we have spacious 3 bedroom rentals that comfortably sleep between 6 and 10 guests. Each of our cabins are loaded with amazing amenities, but they aren’t all the same. They all provide something different that makes each one special from the next. 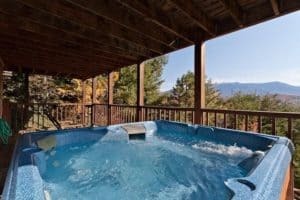 Some of the amenities you will find in a number of our Gatlinburg 3 bedroom cabin rentals include: hot tubs, Jacuzzis, swimming pool access, game rooms with pool, foosball and air hockey, multiple televisions, beautiful fireplaces and much more! All of these amenities make it easy for you to enjoy your vacation wherever you are, including your cabin. A view can be the most important thing to some, but not so important to others. We have cabins that are completely secluded with wooded views, as well as ones with breathtaking views of the Smoky Mountains. Either way you go, you are still surrounded by the beautiful scenery and wildlife Gatlinburg has to offer. Once you follow the first 4 steps, it is then important to do some research on the things available to do in the area and make an itinerary. You don’t have to actually spend a lot of time making a perfect one, but just enough to give you an idea of which area of Gatlinburg you will be around the most. This will help you pick out your cabin location, which is the next step. Now that you have your itinerary all done, you can see which areas of Gatlinburg you will be traveling the most. If you want your location to be convenient, then it is a good idea to pick Gatlinburg 3 bedroom cabin rentals near your itinerary activities. We have several cabins available all throughout Gatlinburg, so you won’t have a problem finding one perfect for you. Of course, the final step is selecting your cabin. Once you know your budget, number of guests, necessary amenities and location, you can determine which cabins fulfill all of your needs. With our cabins at Stony Brook Lodging you may even find all of our rentals exceed your expectations when it comes to having all of your wants and needs met. Congratulations! You now know exactly how to pick your perfect cabin! Take a look at our spectacular Gatlinburg 3 bedroom cabin rentals and book yours today.